In 1853, Karl Marx sent a dispatch from London to be published in the New York Daily Tribune. Reflecting on the role of the British in India, Marx decreed that “England has to fulfill a double mission in India: one destructive, the other regenerating the annihilation of old Asiatic society, and the laying the material foundations of Western society in Asia.” The pain of those material foundations, of course, merely sets the stage for the new world’s worker’s utopia. A similarly gargantuan task could describe the e-books released by Badlands Unlimited. Badlands describes itself as making “books in an expanded field,” a tall order in today’s milieu of nostalgic preservation for the printed book’s 20th century form. 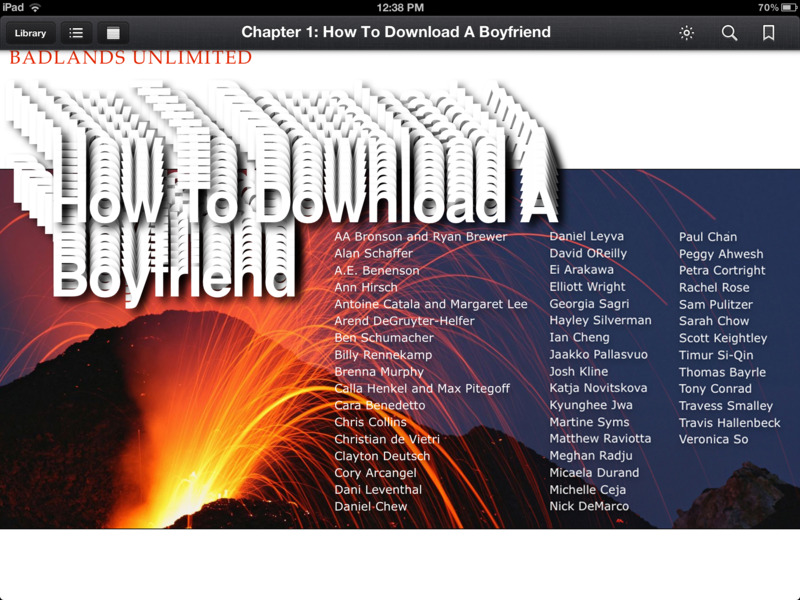 The press’ latest release, How to Download a Boyfriend, features image-based contributions from 50 artists strung together by a tongue-in-cheek interactive quiz about love in the digital age. Ian Cheng offers a peek at Duchamp’s Étant donnés through a BlackBerry camera, while Sarah Chow’s tantalizing cotton candy colored, textured rock face hints at a pleasure of touch that remains unfulfilled by the flat smoothness of tablet technology. Other artists include vanguard stalwards Tony Conrad and Peggy Ahwesh, new media stars Cory Archangel and Petra Cortright, alongside Billy Rennekamp, Josh Kline, Travess Smalley, and other artists that have been previously featured on Rhizome. While the HTDLAB engages with the practice of reading and being an e-book, it's also site refreshingly free of reverence and infused with a spirit of exploration and experimentation. Questions range from the practical (Can I use your Netflix account if we break up?) to the absurd (“What names do you scream into a car crusted pillow with OK Cupid howling on a laptop nearby?”). The interactive answering of questions to which any answer seems equally plausible highlights the ritual of interactivity experienced by all users of Apps and Internet access devices, in which touching the screen sometimes seems as arbitrary as leaving it alone. To that end, Badlands forgoes the popular Apple zoom technique, replacing it with the ability to twist and dance with images as you slide from artist to artist. How to Download a Boyfriend was designed specifically to be experienced on an iPad, a reminder that the embrace of immateriality is accompanied by complicity with monolithic consumer technology. At it's core, How to Download a Boyfriend isn’t a picture book with visual interludes passing as an e-book or a scanned book you read on your phone: it’s simply an e-book. By refusing to repeat tired, overhyped strategies of modernization and creating a showcase of artistic strategies within digital culture, Badlands Unlimited provides a welcome edition to a forum of imagining the future of the book. Faced with the impending annihilation of physical things, the most familiar form of resistance is a return to an artisinal, pre-commodified version of object-culture. Badlands embraces the complex process of dematerialization and ensures that there will be something to look forward to when the physical book, like everything else solid, melts into air.